As always there were many hard fought games at this week’s Thursday action tournament. 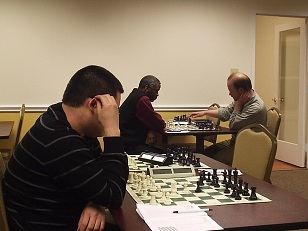 Everything happened as expected and the tournament was won by top-seeded NM Daniel Lowinger. David Childs came closest to throwing the crosstable into chaos. Early in the opening Harris blundered a pawn to Childs which severely weakened his structure and king safety. Fortunately for Harris, he was able to complicate matters and won the game.